Dress up your master bathroom with the Belle Foret Estates Vanity with Granite Vanity Top. Featuring a rich mahogany finish, this vanity offers classic styling that adds elegance and warmth to your bathroom decor. Hand-carved wooden scroll accents, a 3-inch backsplash and antique bronze hardware offer a unique attention to detail and a beautiful focal point. A polished black granite top is pre-drilled for an 8-inch widespread faucet and includes a white vitreous china basin and backsplash. Providing ample storage space, this vanity has six full-extension side drawers and a deep cabinet with one full-extension drawer to store your needed toiletries. Ideal for pairing with the matching Estates collection mirror, this gorgeous vanity is a simple solution to upgrading your bathroom with both style and functionality. 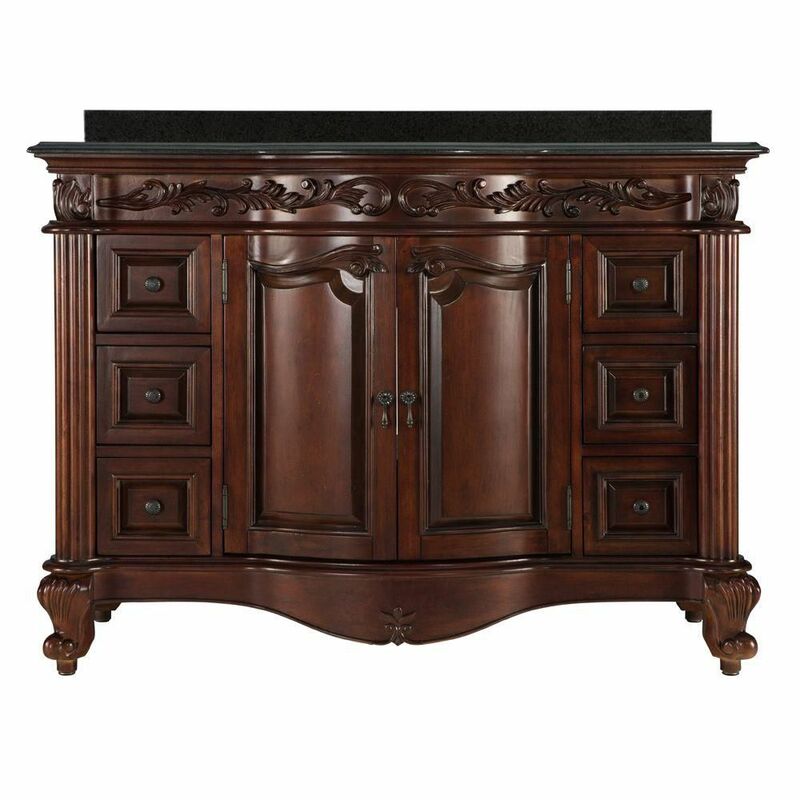 Estates 49-inch Vanity in Rich Mahogany with Granite Vanity Top in Black Dress up your master bathroom with the Belle Foret Estates Vanity with Granite Vanity Top. Featuring a rich mahogany finish, this vanity offers classic styling that adds elegance and warmth to your bathroom decor. Hand-carved wooden scroll accents, a 3-inch backsplash and antique bronze hardware offer a unique attention to detail and a beautiful focal point. A polished black granite top is pre-drilled for an 8-inch widespread faucet and includes a white vitreous china basin and backsplash. Providing ample storage space, this vanity has six full-extension side drawers and a deep cabinet with one full-extension drawer to store your needed toiletries. Ideal for pairing with the matching Estates collection mirror, this gorgeous vanity is a simple solution to upgrading your bathroom with both style and functionality. Estates 49-inch Vanity in Rich Mahogany with Granite Vanity Top in Black is rated 4.5 out of 5 by 131. Rated 5 out of 5 by David from Very good packing. Received item with no damages. A few... Very good packing. Received item with no damages. A few inches taller than expected but that's fine. Makes you want to change the theme of the bathroom to mostly black. Rated 5 out of 5 by Dad 1 from Excellent Vanity Have been looking for a vanity like this for a lot of years. Tried buying it from eBay then Hous but they wouldn’t ship . Looks great nice height. Water marks show but cleans up great! Excellent quality! Glad we finally bought one! Rated 5 out of 5 by Sam from The vanity is absolutely beautiful!!!! Looks great with all... The vanity is absolutely beautiful!!!! Looks great with all the other pieces I bought to go with it. Thank you Home Depot!!!! What is the hight from the floor to the top of the granite back piece? I need the full hight to plan for tile border. thanks. Does the sink have an overflow hole in it? Hello and thank you for your question. Yes, the sink that is included with this vanity does have an overflow drain. Part of the installation steps require the sink to be attached to the top, it can be installed for either a front or rear overflow position as the drain hole is centred in the bottom of the sink. If you have any further questions please feel free to contact our Customer Service department directly at ForemostCanada@foremost groups.com and we would be happy to assist you. do they com in White. Hello and thank you for your question. The Estates collection also comes in an Antique white finish. If you are looking for the 48&quot; version specifically, the model # is ETAVT4922D and can be found on this website. If you have any further questions regarding this or any of our Foremost products please feel free to email our Customer Service Department at ForemostCanada@foremostgroups.com and we will be happy to assist you. Hello and thank you for your question regarding the Estates Vanity Collection. Unfortunately the vanity comes with this top specifically and we do not offer other options in colour. If you have any further questions regarding this or any of our products please feel free to contact our Customer Service department via email at ForemostCanada@foremostgroups.com. Does it come with a sink ? Or it's all flat on top ?